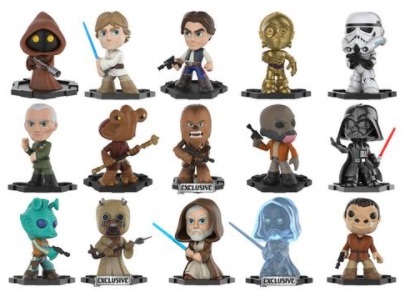 The Force is with every Star Wars fan and collector as the Funko Star Wars Mystery Minis set has arrived! The debut release includes fan-favorite heroes and villains from the classic franchise. 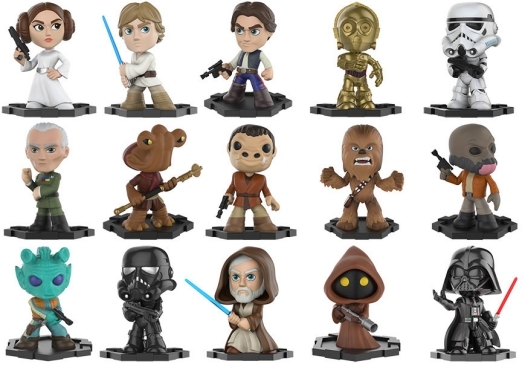 Funko Star Wars Mystery Minis features detailed figures, each posed exactly how their real-life characters would stand. In addition to distinct sculpting and coloring of the miniature collectibles, they differ from most Mystery Minis in that they are mounted on a black, rounded disc just as their larger Pop! Star Wars vinyl figures. Another difference is the fact that these are also listed as being bobble-heads. Enthusiasts for the groundbreaking 1977 film A New Hope will no doubt recognize the Episode IV lineup led by Princess Leia, Luke Skywalker, Han Solo, Chewbacca, Darth Vader and Grand Moff Tarkin. 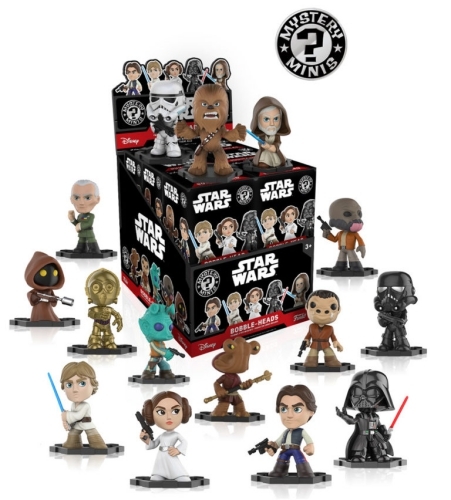 You don't have to be a Jedi to find all the Funko Star Wars Mystery Minis, however, you may need a little luck and patience, as the figures are issued in the traditional blind-box format. In other words, each box is packaged to look and feel the same to keep the contents a surprise until opened. Including known exclusives, there are at least 24 figures to uncover. Given that each case holds just a dozen minis, those wishing to complete the full set will need more than one case, and perhaps several, depending on individual odds. They will also need to visit GameStop, Hot Topic and Walmart for all the exclusive figures. 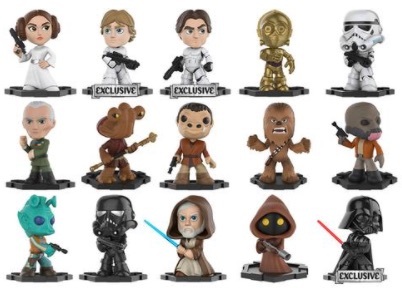 Box odds for the Funko Star Wars Mystery Minis figures are noted below. 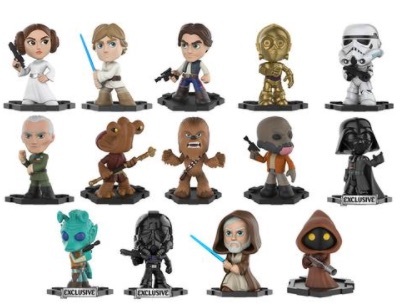 Shop for Star Wars Mystery Minis cases on eBay. Maybe you can answer this for me. Is there a reason some of the figures, like Obi-Wan, have different ratios depending on the retailer? For example, he’s common in the Hot Topic box 1/6, and rare in the Game Stop box 1/36 for the EXACT SAME FIGURE. If you have any light to shed, I really appreciate it. How much is the complete set of star wars the last jedi funko mini mysteries worth? If I were to sell them. Includes all the exclusive figures and both luke skywalker smugglers bounty figures.